When you’re in a profession that provides service you’re guaranteed to deal with difficult customers. Nursing is not the exception. If you have been a nurse for any length of time, you know how hard it is to deal with difficult patients. 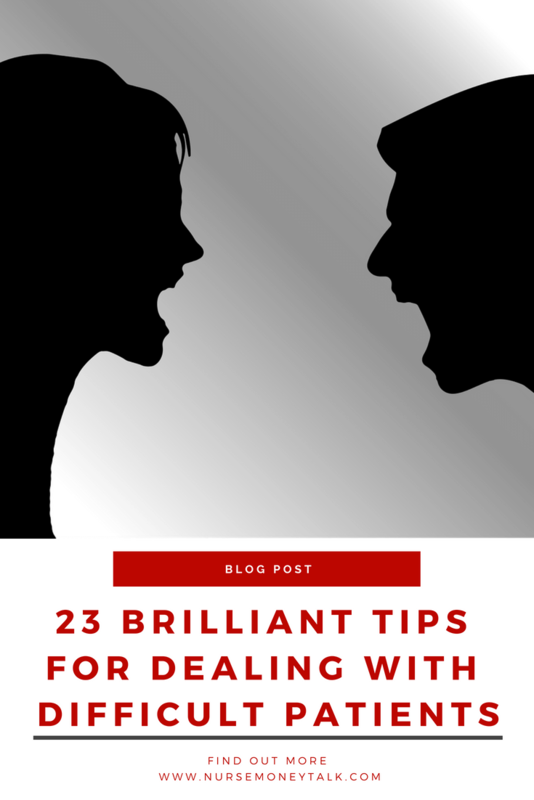 No worries, here are 31 brilliant tips for dealing with difficult patients. This is an exhaustive list, and not all of it will apply to your job or area. Just copy down a couple of them to use the next time you deal with a difficult patient. When dealing with difficult patients, your first gut reaction might be to meet them where they are at. Fight fire with fire, but I encourage you to remain calm. Getting worked up by a patient will cause you to not think clearly about the situation. Make sure to engage the patient in conversation. Some patients will get upset if they feel they are being blown off. Some patients especially the ones who don’t have family or friends might resort to anger and agitation to get attention. To them, negative attention is better than no attention at all. Engaging them might solve some of your problems with them. Sometimes patients become disgruntled and challenging to deal with if they are taking certain medications. Depending on the circumstance it could be something that needs to be managed. For example, older patients might become agitated or confused by a urinary tract infection (UTI). In that situation, you might get frustrated with the patient, but if you fix the urinary tract infection, you fix the problem. Sometimes we get upset at difficult patients for being, well difficult but they could think we are difficult. Make sure they’re educated on what’s going on and what needs to happen. At times we don’t do a good job of informing patients. They think we’re doing one thing when we are doing something else. We all have had patients whose anxiety stemmed solely from the unknown. This patient came in angry and treating staff very poorly. After talking with this patient, I came to find out that he came in for a procedure but wasn’t told why he needed to be there. He thought he might have cancer when the procedure was routine for something else. I’m not sure where the misunderstanding came from, but after explaining the purpose of the procedure to this patient, his demeanor changed. Make sure that you are showing empathy towards the patient. Your patient could be going through some of the worst times of their life, and it is not easy to be stuck in a hospital away from the ones you love the most. Patients that aren’t feeling well and are upset are going to try to argue with you. You are going to want to argue back. You’re not going to win that argument so be respectful and leave it alone. I have heard of nurses getting into a yelling match or argument with a patient. There is no way to spin that story and make yourself not look bad. If you have been dealing with the same patient for a while and you’re not making progress, bring another nurse into the picture. No matter how hard you try, some people will relate better to others than they will to you. There have been many times I have brought somebody else into the situation, or I have been asked to step in on a conversation with a patient because I had a better rapport with the patient. Being confused about what’s happening will have even the easiest going patient agitated. Make sure your patient understands what’s going on. You’re going to deal with many patients that are not informed or are health literate. Some patients won’t care, but other patients will become frustrated because of it. Make sure you are checking with the patient to see if they know what’s happening and if they have any questions. A patient probably doesn’t have a clue what an EGD is let alone Esophagogastroduodenoscopy. Actually, most nurses probably don’t know that’s what EGD means. Instead, practice explaining medical procedures in everyday terms. If you say, “we are going to use a camera to look into your stomach” they are going to understand what you are saying. Some people, during a hospital stay, might not be aware of their behavior. They could be ignorant that their behavior is causing others so much distress. Just gently and respectful talk to them about their behavior. 10. Find out more about the disgruntled patient. Is the patient of sound body and mind? Some present as if they are when they aren’t. Make sure the patient isn’t suffering from delirium or anything like that. Dealing with the same disgruntled patient shift in and shift out is one of the quickest ways to burn out a nurse. Rotate other staff members through to give each nurse time to recharge. You are going to get burned out taking care of the same difficult patient for the eighth shift in a row. Talk to your charge nurse to make sure difficult patients get rotated around. How you handle difficult patients will reflect on your personal brand, and people will remember you for it. No matter how agitated the patient gets, make sure you manage it in a manner that will reflect positively on you. We wrote an article about the importance of nurses creating a personal brand and how to build a personal nurse brand. A positive personal brand is essential for your career success. There shouldn’t be a grey area when it comes to what you find acceptable with a nurse to patient interaction. Make sure that is clear to the patient. Many patients will have poor boundaries. You will need to gently set very firm limits with them. This could mean stating, “I do not answer personal questions” in a polite manner. When interacting with agitated patients make sure you keep an eye on them. Try to make sure they are never between you and the door. While we hope violence wouldn’t happen, violence towards healthcare workers does happen. Be safe! Not dropping your guard becomes very important for those that work in a psychiatric or behavioral health facility. A patient is going to be rude to you. You’re going to hear profanity. This isn’t to imply that it’s right (or wrong) but that it’s going to happen. Patients are stressed for one thing or the other. Sometimes you might have to choose not to take it personally and move on. I’m not saying be a punching bag. Some of your patients could be going through the worst experience of their life. Sometimes we all need a little bit of grace. Reporting a patient requires knowledge of your hospital's policy and the appropriate chain of command. If a patient escalates to a certain point, make sure you know whom to contact and have the phone number easily accessible. You should feel safe and empowered to do your job. If you have a patient that is hindering you from ensuring everyone is safe, make sure you report it. If you know a patient is starting to escalate, don’t just sit there and do nothing. Intervene and de-escalate the patient while you can. Being proactive applies to the nurses working in behavioral medicine. If you see a patient that is trying to work themselves up, try to intervene with coping skills or a distraction of sorts to keep the patient from going into the crisis stage. Communication is primarily non-verbal, and your posture can say a lot. Be mindful of poses that may express anger, frustration, or just indifference because that could also agitate the patient. Make sure your stance matches your tone, open, warm and receptive. If you walk into a situation saying, “I’m going to take really good care of you” but your demeanor is showing you don’t want to be bothered, the patient is going to see that. Your patient could easily be going through some of the worst moments of their life. They can start feeling isolated and think that the world doesn’t care about them. When appropriate, try to show them that you care. Showing that you care doesn’t have to be something fancy or overly complicated. Showing patients that you care can be as simple as keeping your word. Follow through on what you tell them you will do. If you tell a patient you will be checking in on them in an hour, be back in an hour. Letting a patient talk to you about themselves can help distract the patient from their stressful situation. Some patients can be disgruntled until you start asking them questions about themselves and trying to make conversation. They may open up and start treating you differently. Make sure you are taking the time to listen to your patient. Patients can become angry and upset if they start feeling like they are not being heard. If you are not taking the time to listen to your patients they will be less likely to listen to you. Plus, it’s not good quality care. Patients that are in pain can become agitated and very difficult to deal with. Make sure to ask the patient if they are in pain and try to decrease their pain level. In general patients with high acute pain are more difficult to deal with than a patient who is either not in pain or is in a level they find tolerable. Make sure you are addressing the patient’s pain level and other physical needs. Make sure you are doing things that will build rapport with the patient. Showing that you care, and engaging the patient are some of the ways to build rapport. If a patient trusts you, they are more likely to treat you differently than with somebody else that has not built a rapport with them. There are multiple reasons why it’s important to be mindful of how you are dealing with patients who become angry, upset or are just demanding to take care off. Being written-up is one of the first steps taken by supervisors when an employee does not deal with a patient appropriately. You want to completely avoid any formal discipline as this will remain in your employee file indefinitely. You don’t want a black mark to keep coming back if you are pursuing a promotion or raise at work. If your actions are extra egregious or if you are persistent in your failure to treat disgruntled patients with respect, you could get fired. Getting fired from your job could hinder your prospects for other employment. We talk a lot about how important it is to create and manage a personal brand for your nursing career. Yelling at a patient or failing to keep your cool with your patient, no matter how difficult they are, will not be a good way to manage your personal brand. We have gone through many tips. Some of you might want a condensed version. Well, you’re in luck because I’m about to give you what I’m calling the nine rules for dealing with difficult patients. Unfortunately, difficult patients are a fact of life in the nursing profession. While you can’t control the actions of your patient, you can most definitely control your behavior. Any other tips for dealing with difficult patients? If you enjoyed this article or thought it added value to you, please share it.